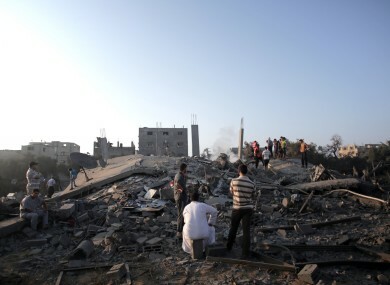 The death toll has risen since Israel began air strikes on the region. ISRAELI WARPLANES POUNDED targets in the Gaza Strip as a major campaign to stop volleys of Palestinian rocket fire entered its second day, leaving 28 people dead and more than 100 wounded. A strike on a home in Beit Hanoun, in northern Gaza, claimed the lives of a commander of the Al-Quds Brigades, the armed wing of Islamic Jihad, his parents, a woman and two children, emergency services spokesman Ashraf al-Qudra said. Another strike early today on the southern city of Rafah killed a young man. The deaths brought to 28 the number of fatalities since the launch of Israel’s Operation Protective Edge early on Tuesday, with the Jewish state not ruling out a ground operation to stop the rocket attacks. Israeli air strikes took the lives of 24 people while four Hamas militants were killed staging a beachfront assault on an army base just north of the besieged Strip. During the day Israel staged multiple air strikes on the Gaza Strip, which also left more than 100 wounded, and militants from the Islamist movement Hamas hit back with rocket fire on Israel’s major population centres in Jerusalem and Tel Aviv in the most serious flare-up over Gaza since November 2012. As sirens wailed across the Holy City, three loud explosions were heard and a series of flashes lit the sky to the southwest. Police said one rocket fell in the vicinity of Ramat Raziel, some 10 kilometres (six miles) from the city’s southwestern flank and two more fell in outlying areas, without elaborating. Police spokeswoman Luba Samri said there were no reports of injuries anywhere in the Jerusalem area. The Ezzedine al-Qassam Brigades, the armed wing of Hamas, said it had fired four M75 rockets at Jerusalem, which lies 65 kilometres from the Palestinian enclave. It also claimed to have launched a rocket at Haifa, 165 kilometres away. There was no report of anything hitting the northern port city but the army said a rocket did fall on Hadera, 100 kilometres north of Gaza. Hamas militants also said Tuesday they fired four rockets at Tel Aviv, 60 kilometres north of Gaza, setting sirens off across the city. Earlier, another rocket aimed at Israel’s commercial capital was shot down by the Iron Dome anti-missile defence system. Israeli authorities said that public bomb shelters in Tel Aviv and Jerusalem had been readied for use. Palestinian president Mahmud Abbas has demanded Israel “immediately stop” its air campaign and called on the international community to pressure the Jewish state. “The Palestinian Authority will go to all international organisations to seek protection for the Palestinian people,” he said in a televised statement. In Tuesday’s worst strike, a missile slammed into a house in the southern Gaza city of Khan Yunis killing eight people and wounding 25, emergency services spokesman Ashraf al-Qudra said. Witnesses said an Israeli drone fired a warning flare, prompting relatives and neighbours to gather at the house as a human shield. But an F-16 warplane fired a missile at the building, levelling it. Hamas denounced the attack as “a horrendous war crime” and vowed retaliation against “all Israelis”. In addition, Israeli troops killed four Hamas militants who reached the Israeli coastline by sea and tried to attack an army base near Zikim. “A number of terrorists came out of the ocean and attacked… with Kalashnikov rifles and hand grenades,” said Lieutenant Colonel Peter Lerner, who said they were all killed. The attack was claimed by the Qassam Brigades. Email “28 dead as Israel pounds Gaza Strip”. Feedback on “28 dead as Israel pounds Gaza Strip”.